View of the proposal facing Bloor Street. Photo courtesy of Mirvish Village. 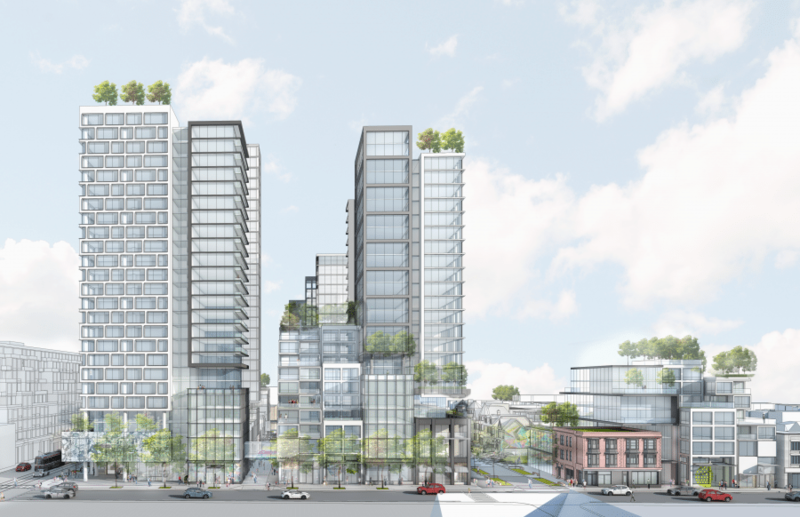 On March 2, residents got a chance to see the latest, and likely final, development proposal for the Bloor and Bathurst corner that was once home to Honest Ed’s. The latest proposal—the third in as many years—offers up a more open, pared-down development plan that preserves more heritage buildings than previous iterations, while offering more park space, less car traffic, and a reduction in the height of many of the buildings. Notable additions to the proposal include the retention of the Honest Ed’s laneway (partially eliminated in previous versions) and 23 heritage buildings, as well as the decision to bury all parking, service, and loading access below the project. Photo courtesy of Mirvish Village. Broadly speaking, the process of public consultation has helped to allay some of the residents’ concerns. Many community members spoke in support of the revisions to the design (some noting that they were hesitant to do so before), and many were happy to see that more heritage buildings were being retained. Some concerns with the proposal are more specific. For instance, the desire for less car traffic means that all parking, service, and loading is underground, concentrated on a single access point on Lennox Street—a street which, as it stands now, will unlikely be able to handle that sort of volume easily. With that said, this proposal brings the project within striking distance of approval; Graig Uens from the city planning department said that they are recommending that this latest proposal be approved. This is a good thing: if you can accept the simple fact that Honest Ed’s is no longer, this plan is a good one—it includes provisions for park space, micro retail, and an open-air market, in addition to residential towers. Developers will never be able to please everyone, and the pushback from residents will never disappear completely. However, in this case, the long consultation process appears to have been successful and has resulted in a proposal that will transform Bloor and Bathurst for the better.